Promise Paen, captain of Victor Company's mechanised armoured infantry, is back for another adventure protecting the Republic of Aligned Worlds. Lieutenant Paen barely survived her last encounter with the Lusitanian Empire. She's returned home to heal. But the nightmares won't stop. And she's got a newly reconstituted unit of green marines to whip into shape before they are deployed. If the enemies of the Republic don't kill them first, she just might do the job herself. Light-years away, on the edge of the Verge, a massive vein of rare ore is discovered on the mining planet Sheol, which ignites an arms race and a proxy war between the Republic and the Lusitanians. Paen and Victor Company are ordered to Sheol, to reinforce the planet and hold it at all costs. On the eve of their deployment, a friendly-fire incident occurs, putting Paen's career in jeopardy and stripping her of her command. When the Lusitanians send mercenaries to raid Sheol and destabilise its mining operations, matters reach crisis level. Disgraced and angry, Promise is offered one shot to get back into her mech suit. But she'll have to jump across the galaxy and possibly storm the gates of hell itself. "The action scenes are plentiful; however, while Bauer sketches in the outline of the politics shaping Montana's history, a strong picture of why the various forces are fighting for control of the planet is never really conveyed." "Bauer puts together characters who take up residence in your heart, the cold-blooded politics of the "Great Game," the power of devotion and loyalty, and the human cost carnage extracts from even the most courageous. I highly recommend it." "Lieutenant Promise Paen really doesn't need the voice of her dead mother nagging her as she stands at the threshold of interstellar war. Or, does she? Unbreakable is a little bit Starship Troopers and a little bit Esmay Suiza, with a dash of Firefly for flavor. 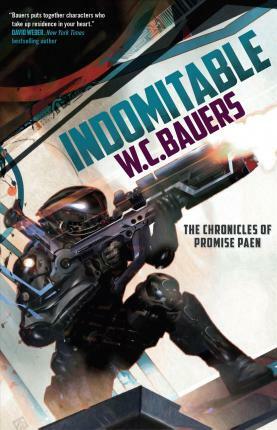 W.C. Bauers gives us everything we want in our military science fiction, but never allows the hardware and action to overshadow Paen and everyone else caught in the crossfire." W. C. BAUERS has worked on the sales side of publishing for more than thirteen years. Unbreakable is his first novel. His interests include Taekwondo, reading and writing military science fiction, toting gear for his Alpha Unit, and French press brewing. He lives in the Rocky Mountains with his wife and three boys.